STOP RIGHT HERE if you haven't read the first book in the series, Incarceron, and don't want any spoilers! In this stunning sequel to the critically acclaimed Incarceron, seventeen-year-old Finn has escaped from the sentient prison only to find that things Outside are not at all what he expected. Claudia, the daughter of the prison's warden, has declared Finn the lost heir to the throne. But another claimant emerges, and soon, both Finn's and Claudia's very lives hang on Finn convincing the Court of something that even he doesn't fully believe. Still trapped within Incarceron, Finn's friends Keiro and Attia hunt for the magical glove, which legend says Sapphique used to escape. In order to find it, they must battle the prison itself. Incarceron has built itself a body and it wants to go outside - just like Sapphique, the only prisoner Incarceron ever loved. Catherine Fisher is the master of keeping readers on the edge of their seat. 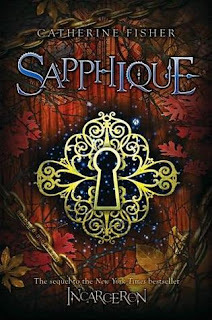 Picking up not long after the cliffhanger ending of Incarceron, Sapphique once again throws readers straight into life Inside. However, instead of reading this from Finn's perspective - now impossible, as he is now living Outside with Claudia - we are thrown into Attia's point of view. Optimistic yet afraid, Attia's only hope is to try to survive long enough to meet back up with Keiro so she will be there when Finn comes to free them. Finn, on the other hand, is quickly learning that life Outside is not all it's cracked up to be. His seizures are still ongoing, and he quickly learns that he is facing a new threat - there is another claimant to the throne that may or may not be rightfully Finn's. Claudia life has also been thrown into chaos, as her father, The Warden, has disappeared into the Prison and her status in court is now in question. This is especially not helped by the fact that she is supporting Finn, when there is no legal way under Protocol to scientifically verify his identity. Fisher adeptly weaves these individual tales into an epic saga, leading to a very open yet still satisfying conclusion. 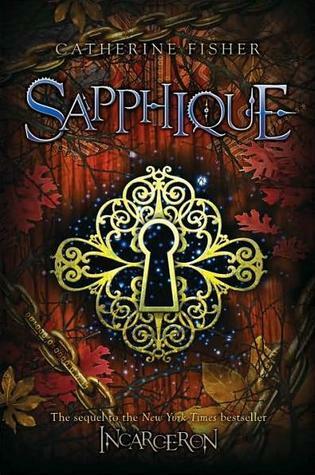 I loved Incarceron and couldn't wait to get my hands on Sapphique, the end of the series. The one weakness to the sequel, however, is that Finn and Claudia are now together, so the point of view inside the prison comes from Attia, a secondary character to whom I was not particularly attached. I found the parts from Attia's perspective to be rather slow, as it was just difficult for me to get inside her head. What was happening Outside more than made up for that shortcoming, though. I was kept guessing right up to the very end, which rarely happens. Fisher has a real talent for suspense. If you haven't tried this series yet, I strongly suggest that you do so soon! Catherine Fisher is the author of numerous other books, including a personal favorite of mine - Corbenic - based on Arthurian legend, and several series, such as The Snow Walker, The Book of the Crow, The Oracle Prophecies, and The Relic Master.